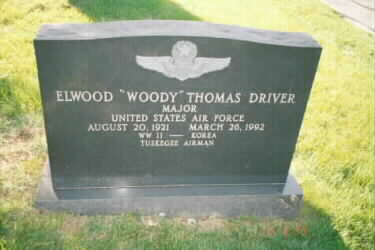 Elwood Thomas Driver was a World War II Army Aviator. Renowned Tuskegee Airman and Federal Government official. Driver, a native of Trenton, New Jersey, earned his bachelors' degree from the New Jersey State College in 1942. He later earned a masters' degree in safety from New York University. Driver was comissioned as a Second Lieutenant in the U.S. Army Air Corps in October of 1942 and served as a combat pilot and flight leader with the 99th Fighter Squadron. He was officially credited with 1 combat victory over a German Focke-Wulf 190 aircraft on February 5, 1944. He also had one "probable" victory as well. By the end of the Second World War, Driver had completed 123 combat missions. After retiring from the Air Force following a 20-year career, Driver served for 5 years as the Chief, System Safety Engineering, for North American Aviation. He was then hired by the National Transportation Safety Board (NTSB). He was the NTSB's Associate Administrator for Rule Making from 1967 to 1978. He then accepted a Presidential appointment, serving as the Vice Chairman of the NTSB from 1978 to 1981. Driver is buried in a place of honor, in front of General Daniel J. "Chappie" James, Jr.
Elwood "Woody" Thomas Driver was born on 20 August 1921. He served as one of the original Tuskegee Airmen (an all-black Army Air Corps combat unit of World War II fame). Folloiwng his tours in the military he served as, among other things, the Vice Chairman of the National Transportation Safety Board. Following his death on 26 March 1992, he was laid to rest with full military honors in Arlington National Cemetery.